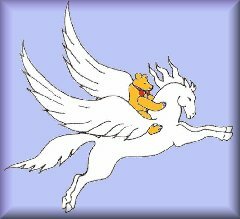 Welcome to the Flying Horse Teddy Restoration Website! We offer a complete teddy bear repair and restoration service to customers in the UK and internationally. All repairs are carried out with the greatest care to a professional standard, to restore well-loved bears to as close to their original condition, or to a state of appropriate completion, as possible. Traditional materials and techniques are used to provide excellent results that have been appreciated by our many customers over the years.... please take a look at some of our customer comments! We undertake all types of restoration work, from surface cleaning, to replacing eyes, paw pads, nose stitching, right through to missing limbs! Costs are sensible, but understandably variable, depending on the difficulty of repair, the availability of matching fabric/mohair, and the time involved. Please contact us for further details... images of the prospective 'patient' are always appreciated! We have been collecting vintage bears for many years, and have restored examples for private individuals, dealers, and teddy bear museums in the UK and abroad. Working with these valued bears has given us a deep understanding of their construction and the best methods of providing a restoration service that is both of a high standard and sympathetic to the age, make, and condition of the bears. Our experience of designing and making our own bears under the label 'Flying Horse Original Designs' has also helped to develop the necessary techniques.... our bears have been sold to delighted customers all over the world... the world-famous Hamleys toy store in London was one of our outlets! Tel. +44 (0)2392 736634 .... (UK mobile 078 365 19685). We are pleased to announce the creation of a sister site... Flying Horse Collectables... on which we will be offering vintage teddy bears, fountain pens, toys, dolls, and other collectables, for sale. The site is already online, but still officially 'under construction', while we collect content for the various pages. Please check it often to see the new items!